In a key event of September's National Voting Rights Month, the Rev. 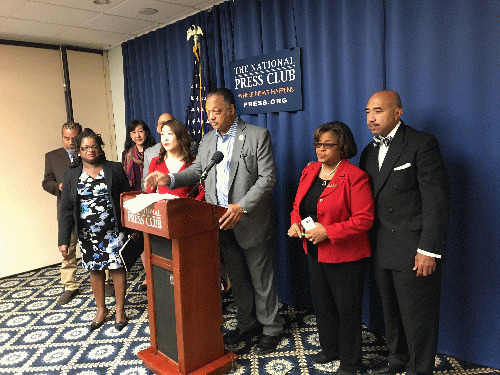 Jesse Jackson and DC civil rights attorney Barbara Arnwine today announced the establishment of a new commission to "document and address the national scourge of voter suppression" at the National Press Club in Washington, DC yesterday. More specifically, according to its anticipatory press release, it will address "voter registration, universal early voting, automatic voter registration at age 18 and restoration of voting rights for ex-felons. It will also produce reports and recommendations to guide public policy in the areas of voting rights and civic engagement." Comprising "prominent voting rights experts, scholars, elected officials, lawyers, students and community activists, the commission will hold a series of hearings around the country to gather testimony directly from U.S. citizens about the undue and often illegal barriers which hinder their ability to effectively participate in the franchise," a similar document clarified. The commission has been formed as a "counter-narrative" to the ridiculous "Commission on Election Integrity" catalyzed by President Donald Trump to prove that the 3,000,000 to 5,000,000 popular votes former Secretary of State Hillary Clinton won in excess of his were the result of voter fraud (more on this "commission" below). The guises voter suppression can assume are legion, and so the task is huge. "Turning pain into power" was the theme Rev. Jackson used to describe tragedies in the past that were followed up by significant milestones. On the heels of the assassination of Medgar Evers on June 11, 1963 by right-wing extremists, pain became action as the August 28, 1964 March on Washington for Jobs and Freedom empowered idealists and activists, especially with Rev. Martin Luther King Jr.'s "I Have a Dream" speech. In the shadow of the Charlottesville massacre, consider the empowerment of voters in Illinois with its new automatic registration program that has already added nearly 2,000,000 voters to the rolls; even non-felons serving prison sentences can register to vote. Oregon pioneered automatic registration last year, successfully increasing its number of new voters by 100,000, a rate of 43 percent of all newly registered, more than half the turnout rate of 80 percent (these figures published by the New York Times on December 2, 2016, click here). Looking back at Election 2016, the reverend wondered why we didn't respond more effectively when Democratic presidential candidate Hillary Clinton won the popular vote by millions of votes and was still declared the loser according to electoral votes Trump amassed-- many of which that were, to say the least, questionable. Rev. Jackson announced an exhaustive five-day tour through Virginia to be undertaken by his Rainbow Push Coalition beginning this week, beginning in Charlottesville and traveling throughout the Dominion State, as well as another to New Jersey. The goal is to reach potential voters, Latinos, blacks, and Asian Americans, at community colleges among other venues, one-on-one or with rallies and other outreach to convince them of the importance of their vote and motivate them to assert their will up against huge barriers the Commission and the Coalition are committed to toppling. "We must travel," the reverend continued, "from door to door and church to church." In Philadelphia, with its burgeoning inner-city population, 25,000 people who registered found that their names were absent from the rolls when they went to vote; throughout Pennsylvania the total was 50,000 (100,000 were similarly not processed in North Carolina and Florida). The Quaker State allows no early voting but accepts absentee ballots early, with an excuse. On Election Day, the polls are open from 7 a.m. to 8 p.m., period. The system is archaic, Jackson said. The people need a fuller picture--particularly of the antics that are pulled in swing states such as Michigan, Wisconsin, and North Carolina. In Detroit, 77,000 ballots were distributed in 2016 that were missing the top line of options, the presidential candidates. Trump won the state by 11,000 votes. But we did win Virginia via get-out-the-vote phone calls, noted Andrea Miller, executive director of People Demanding Action. This year, registration there will close on October 16; there is no early voting, nor election-day registration. Thirteen states altogether, including New York and New Jersey, don't have early voting. Between 2012 and 2015, fully 285,000 voters were eliminated from rolls throughout the country. All of those in targeted categories should check and re-check their registration status every six months. Georgia in three months purged 700,000 voters via caging but was forced to restore 315,000 of them when the deed was publicized. Not enough. It is registration time. The first weekend in October is the deadline in many states that don't allow election-day registration (EDR), something most of those qualified to vote don't know. On National Registration Day, September 26, thousands of groups will work to get voters to register and help them in this process. Co-chair of the new commission Barbara Arnwine traced its predecessors to the organization she founded last year, the Transformative Justice Coalition, with its offshoot the Voting Rights Alliance. The new commission will be nonpartisan; it was the people who lost the presidential election in 2016, not the Democrats, said Rev. Jackson. This year there are major races in Virginia and New Jersey along with hundreds of mayoral races; yesterday the New York primary handed an expected Democratic victory to the popular Mayor Bill de Blasio. 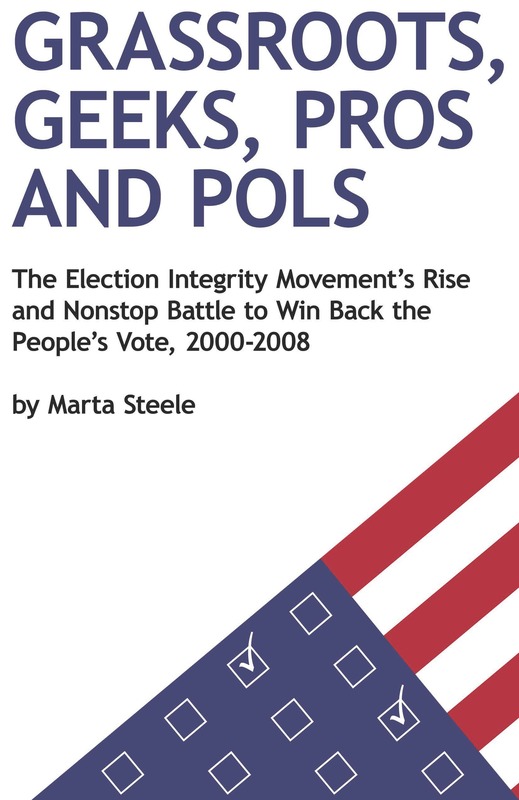 Voting Rights Month also reminds us of the mockery of democracy we are allowing to occur all around us--a very recent case in point the second meeting of Pence/Kobach's Commission on Election Integrity (see my report on this at https://www.opednews.com/articles/Presidential-Advisory-Comm-by-Marta-Steele-Election-Fraud_Election-History_Election-Integrity_Election-Law-Violations-170912-56.html). Falsehoods Kris Kobach, not only secretary of state of Kansas aspiring to be its governor but also a columnist for Breitbart News, has been perpetrating include his assertion that Democrat Maggie Hassan won her New Hampshire Senate seat by having Massachusetts voters bused in to the polls in her state which he said amounted to more than 5,000 fraudulent votes. Kobach claimed that students and others domiciled in New Hampshire using out-of-state driver's licenses as voter IDs were breaking the law. New Hampshire SoS Bill Gardner set him straight on that--clarifying the state law that allowed this practice for all citizens who resided in his state, no matter where they or their driver's licenses came from. "The mainstream media picked up on Kobach's [version of the truth]--we need to counter this narrative," said Arnwine. But where can articulate progressives spread the word on television? Where are the opportunities to refute the lies to a wide public? There were 11 of our new commissioners here today and we hope that thousands will join our cause in the cities we travel to, where we will rally, she said. Among these commissioners were Gary Flowers, Janice Mathis, Grace Kim, Hyepin Im, and Rev. Mark A. Thompson. Others, including Rep. Maxine Waters, Sen. Bernie Sanders, Attorney Junius Williams, Rev. Al Sharpton, Sen. Elizabeth Warren, Jim Zogby, and Attorney Juan Thomas, were unable to attend today. Co-chairs of the Commission for Voter Justice will be Rev. Jackson (honorary) along with Barbara Arnwine, Pennsylvania state senator Vincent Hughes, and John Nichols, national affairs correspondent for The Nation.